I have enjoyed gardening most of my life… Something about my hands being busy that allows my mind to rest. I also like that there is a beginning and an end to gardening projects. It is an empty space, a little work and then it is full of life. Weeds are messy, pull them and do a little pruning and it is beautiful again. As a mother, my life is one endless to-do list of tasks and activities. Having a hobby that allows me to find a gentler, rested mind is so important. 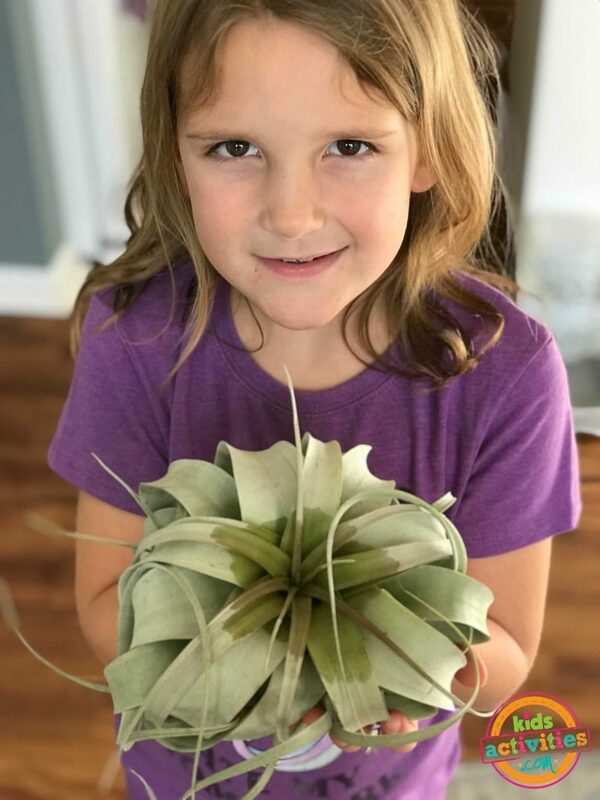 Air Plants are one of the first gardening projects I introduced to my small children. Though they don’t live on air alone, they are remarkably easy to care for. And you don’t have to get a babysitter for your plants when you go on vacation! My kids are fascintated with the giganitc air plant in the photo above. It is called a Xerographica and they get really huge! It is our favorite by far! The first rule of air plant care is that like other plants, even air plants need food, water and sunlight. But air plants have no roots, so they need no soil. If you order your air plants online, at a source like Amazon, make sure and open the box as soon as you get them, they will have been without water and sunlight for a few days. 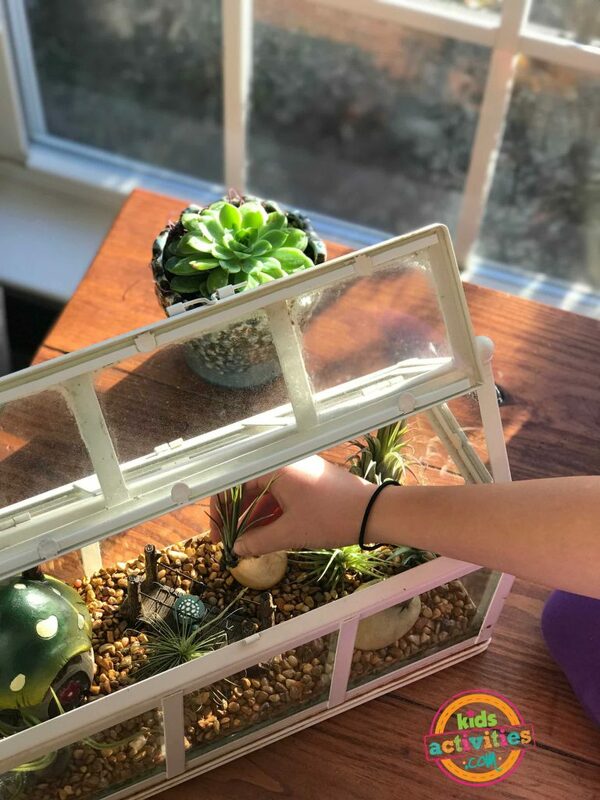 If you purchase your air plants at a nursery, they will likely have been cared for but you will want to feel if the leaves are brittle and dry. Every 2 weeks or so, you will want to give your air plants a good soak in a water bath. I just do this in my kitchen sink. Make sure you wash any chemicals out of your sink if you have scrubbed the sink recently. And fill the sink with tepid water. Drop in your plants and leave them in the water for 20-30 minutes. When you take the plants out of the water, you’ll want to give them a gentle, upside down shake so that no water is left sitting in the leaves. Then leave them somewhere they will dry within about 4 hours. I just sit them on a kitchen towel in front of a window. Your plants will need watering 2-3 times a week depending on your climate. But you can do in between waterings by just spritzing them with a spray bottle. You will be able to tell when then need water by feeling their leaves. When they feel dry and begin to feel more brittle, you’ll need to spray them. From there you can use them to create cute centerpieces or add greenery to places that other plants will not thrive. Air plants do need light. But diffused light from a window or overhead fluorescent lights work just fine. Direct sunlight is fine for a few hours but it will dry them out more quickly. Air plants also need food. The simplest way to do that is to spritz them with a liquid air plant fertilizer once a month. So that I don’t forget my plants care, I keep them on a simple calendar schedule. ?Soak your air plants on the 1st of every month and spritz them with liquid fertilizer after they dry. Soak them again on the 15th of the month. Spray them with a water bottle a few times a week as needed. Once they are dry, just drop them back into their places in your home! 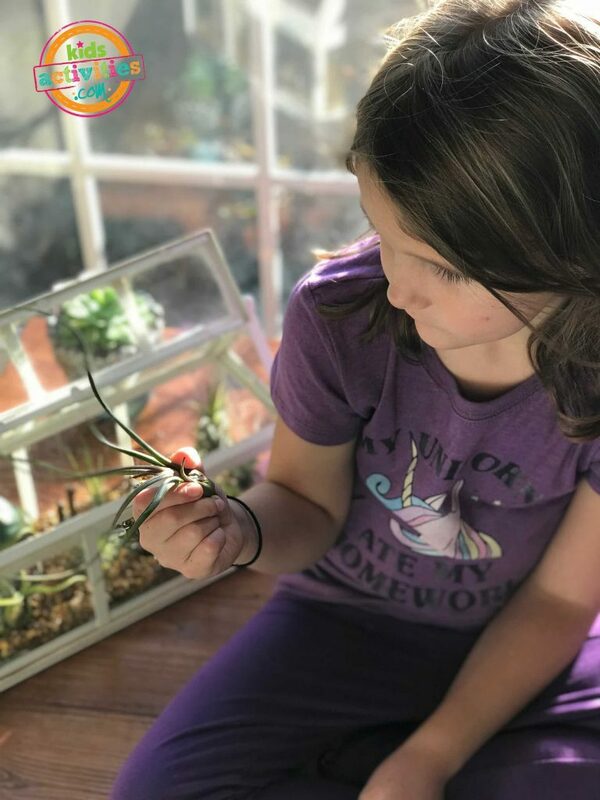 My kids love helping me care for our Air Plant Fairy Garden. We used an inexpensive terrarium that was given to us by my sweet mother-in-law. And some cute fairy furniture that she found at a nursery near her house. ?We layered foil on the bottom of the terrarium to provide a layer between the pebbles and the glass, then filled the bottom of the terrarium with tiny pebbles. 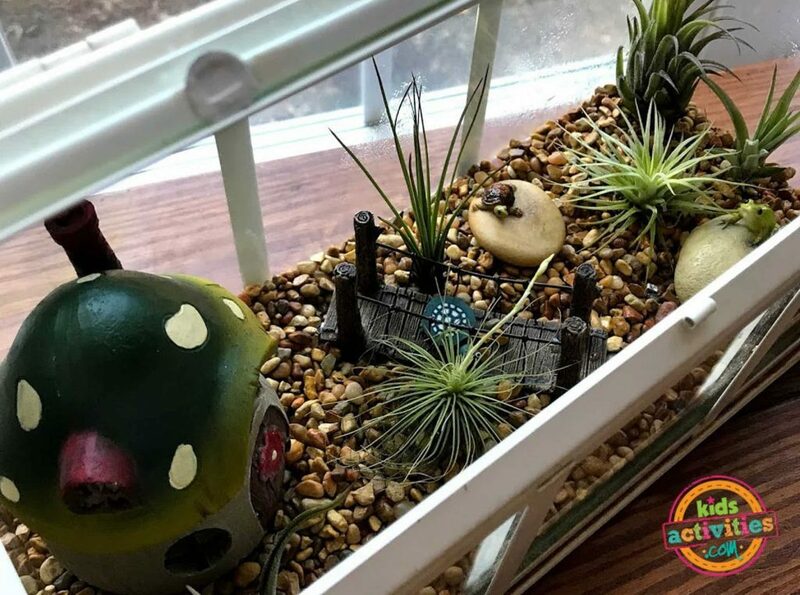 We placed the fairy furniture into the terrarium and then places the air plants around them brushing the tiny stones around the base of the air plants to hold them upright.